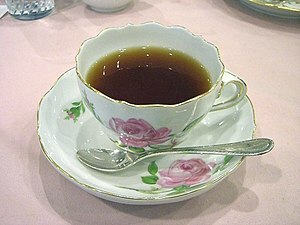 Low Tea occurs between two and five in the afternoon. It consists of tea and light snacks, such as small sandwiches, scones, or pastries. The tea is traditionally served with milk and sugar at a coffee table of low height, hence the origin of the name Low Tea. High Tea is traditionally served from five to seven in the evening, and is more of a meal. It is served at a dining table of higher height, thus the origins of the name High Tea. A number of substantial dishes often accompany the tea, instead of cakes and biscuits (the English word for cookies), and High Tea can also be referred to as Meat Tea for this reason. Afternoon tea consumption began in England around 1661 when Catherine of Braganca married King Charles II and brought the tradition over during her relocation to London from Portugal. The English embraced the ritual so much, that you would never think it originated somewhere else! Drinking tea is synonymous with British culture. When hosting an English guest after your relocation to London, make sure you offer them tea instead of coffee. Afternoon tea in the United States is often a formal occasion that occurs in a hotel or restaurant with fancy teacups and a tiered cake stand full of beautiful treats. For Brits, afternoon tea is usually a much more casual affair with a cup or two of tea and some biscuits. So, do not worry so much about your presentation when hosting a friend for tea after moving to London. The most important thing is that you have tea and biscuits available and offer them to your guest. So, you aren’t a tea drinker? There are some basics to serving tea that you should know. Most Brits will be happy with any tea that you offer them, but I did hear from a friend that her British guest was such a stickler about having proper English tea that my friend ran out late one night to get some for her! You can avoid a situation like this by stocking at least one good staple English tea in your cabinet. It is always nice to have a few choices to offer your guest, but if you are still not a fan of drinking tea after your relocation to London, one good tea is fine.